Last night, standing in the street outside the home of friends after a delicious dinner of chops from local lamb, I told Jaana that it was time for Shadowcook to take stock of her calories. As soon as I got home I signed up once again for the only eating plan that makes sense to an obsessive person like myself: Weight Watchers Online. I’ll be counting points and calories for the duration. That should not be taken to mean an end to my blogging. It means only that for the next while I’ll be trying to create meals that stay within my week’s allotment of points. A boring change for some; a welcome change for others. However, since I’m soon leaving for a week in New Orleans, where I have reservations at three of the city’s finest restaurants, I promise it will not be dull. Michael Pollan is my guide these days. He says, Eat food, not too much, and mostly plants. That prescription suits my mood to reduce. This recipe comes from Epicurious. I overlooked it when it appeared in the January 2007 issue of Gourmet. Swearing it was the best salad she’s had in ages, Patrice brought it to my attention. Finally I made it and got the point. It’s the best example of a simple, delicious salad I’ve encountered in a long time. For the WW Counters out there, each serving is worth 2 points. Whisk together shallots, lemon juice, salt and pepper in a small bowl, then add oil in a slow stream, whisking until combined well. First of all, I never make this salad with anything but lacinto kale, known also around here as dino kale. Use a pound of kale. It’s just too good. I chopped the kale almost like chiffonade. I make the dressing in a jar and shake it until it emulsifies. The amount of dressing is perfect for a pound. It feels slightly underdressed and light, which is how I like salad dressings. Make sure to toss it well. I dress the salad about 20 mins to half an hour before I serve it to let the dressing soak into the leaves. Lacinato kale is sturdy, so the soaking-in time won’t make the leaves soggy. I think several friends now have become converts to this salad. I never thought a raw kale sald would be edible, but in fact I could eat this all year long. I’m nuts about this salad. 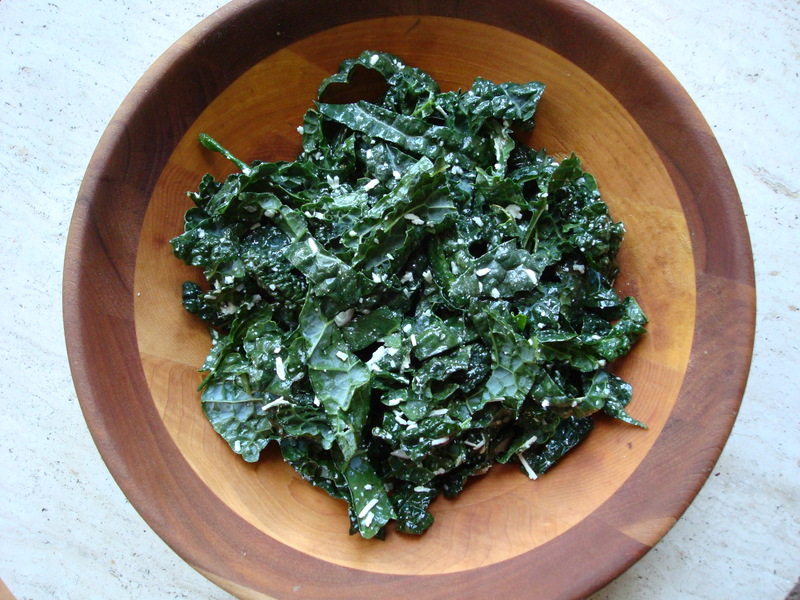 The saltiness of the ricotta salata is a perfect foil to the hearty kale. I made one tiny change in the recipe though: I added a bit of champagne vinegar to the dressing of lemon and olive oil, which perked it up a bit. The only downside to this salad is its high prep time — cleaning every leaf! — but the cleaned and cut kale holds up so well one could easily make enough to have on hand for several days. Oh my mommy! These were fantastic. Thank you for the recipe. I have a cooking recipe site as well and I��d like to exchange links with you. Let me know if this is possible. Thanks.